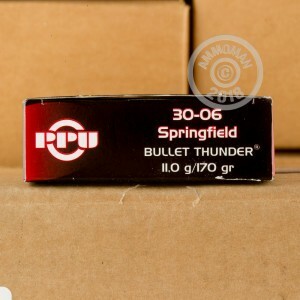 Thunder ammunition continues Prvi Partizan's tradition of loading high quality cartridges for hunters. 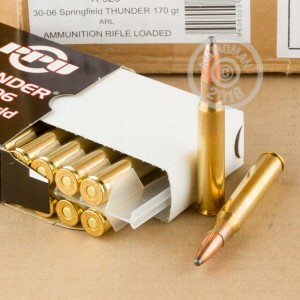 These .30-06 Springfield rounds come in boxes of 20 and fire a 170 grain soft point bullet that consists primarily of copper, with a small lead core and tip. A muzzle velocity of 2,430 feet per second ensures expansion capable of bringing down elk and other large game. 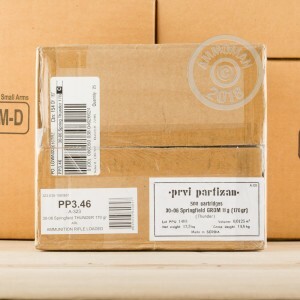 Prvi Partizan ammunition is manufactured in Uzice, Serbia using non-corrosive Boxer primers and brass cases. Buy all the ammo you need at AmmoMan.com, where all orders over $99 come with free shipping!